Last year my Grandma sent me a copy of Needlecraft magazine from 1925. In it I saw illustrations of very simple children’s kimonos, and it occurred to me that it was time for these darling little “frocks” to make a comeback. This is a simple version of those little dresses. The dress has an easy silhouette much like a little smock dress but with a more flattering fit. I think the shape is fresh and fun and leaves lots of room for your creative expression. You’ll see this in the next few posts when I introduce you to the many options you can select in this pattern. All three views included in the pattern feature a unique one-piece yoke with a V-notch at the front neck and a button-loop closure at the back. 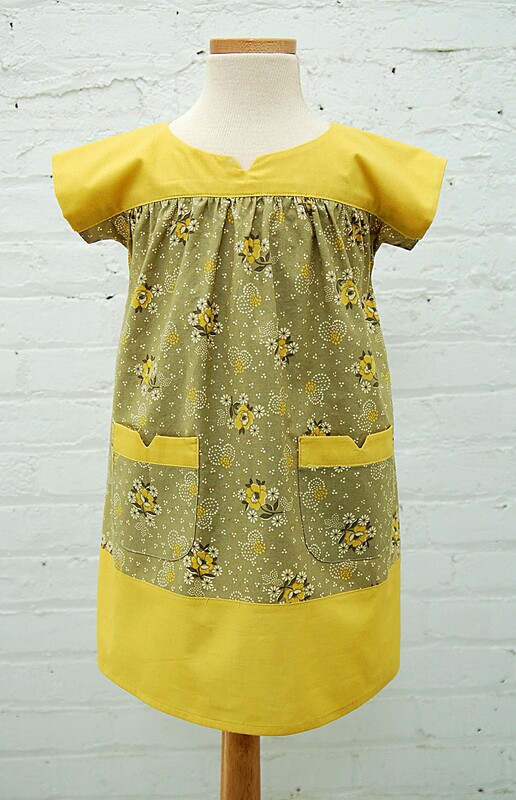 This dress is quite easy to sew since there are no sleeves or shoulder seams. Of course that means there aren’t a lot of pattern pieces, too. We spent a good deal of time time researching the best construction method for this dress, and I’m really pleased with the result. The yoke is lined so the inside looks the same as the outside. The hem of View A is also made from two layers of fabric. If you stitch the sides of the dress with French seams, the inside of the dress will be as beautifully finished as the outside. 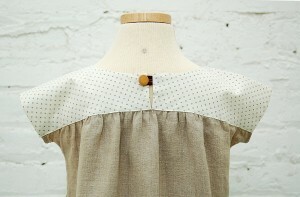 I love including details like this that a good seamstress will appreciate. 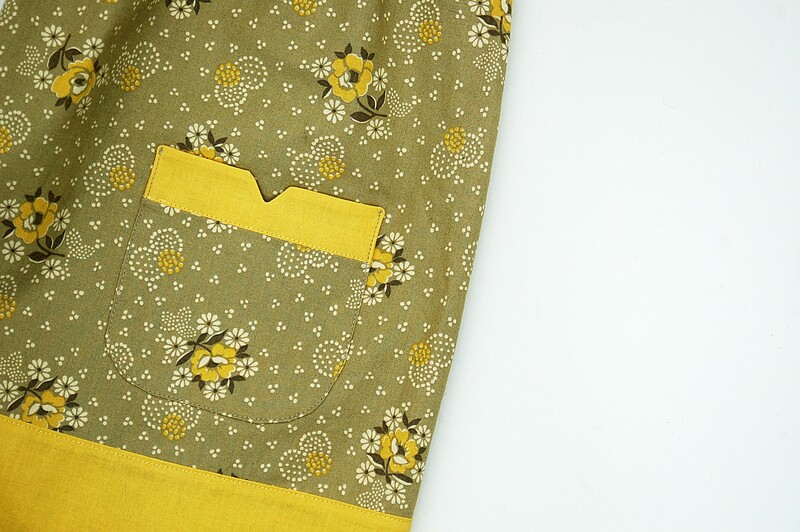 View A of the pattern also includes pockets with a notched detail that matches the notch at the yoke. For this pattern we suggest using light- to medium-weight woven fabrics like quilting cotton, broadcloth, lawn, shirting, poplin, fine-wale corduroy, silk taffeta or dupioni, and linen. I made this version of the dress in linen and cotton last fall, and S wore it over a long-sleeve T-shirt with tights and a cardigan all winter. It looks great layered, so you’ll be able to use it all year long–not just during the spring and summer. We’ve rated this pattern’s difficulty as two of four scissors. I can’t wait to see what you make with it! And I’m excited to show you Views B and C in my next post. Stay tuned! Oh I love this dress! 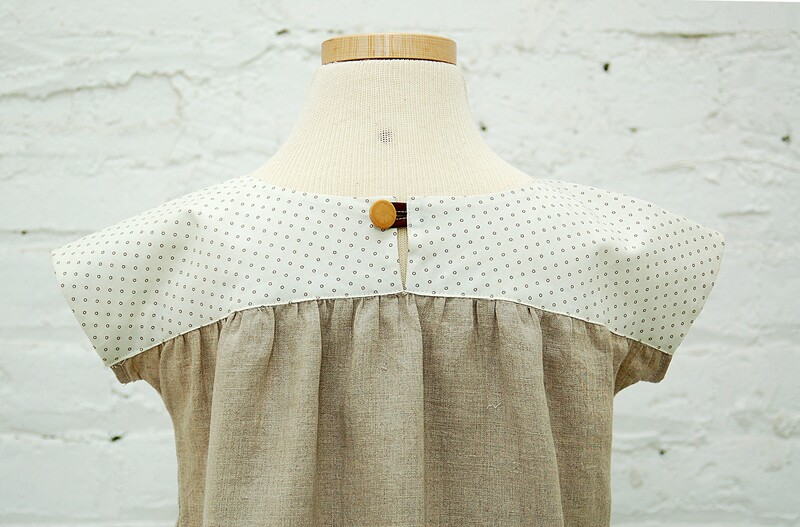 The shape is so beautifully simple and the fabric choices could really shine. really love the linen and cotton version. this is such a cute dress on. I LOVE that linen cotton version! and that French seams option too, because alas, I am serger-less. Beautiful! 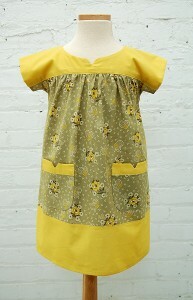 Looking forward to the pattern and sewing a few of these cute dresses up for my daughter. so sweet! really like this dress, would look so adorable over those capri leggins that are everywhere this spring too! Can’t wait for the new patterns! The dresses are just adorable. I’m so excited about this dress. I love the sample with the yellow yoke, so sweet. Every summer my daughter designates a “pool dress” — her favorite for slipping on over her swimming suit. This looks like a perfect candidate. The excitement is beginning to boil over! Okay, I had to come back and comment one more time – just from an artistic expression. That last photo… very, very creative. The artwork on the wall, the colors of the dress, her tights and shoes, the perceived crack on the marble tabletop. It reminds of looking into a mirror with another mirror – the art just keeps going and going and going. can’t wait for the pattern! what a lovely little dress! This dress is just perfection! 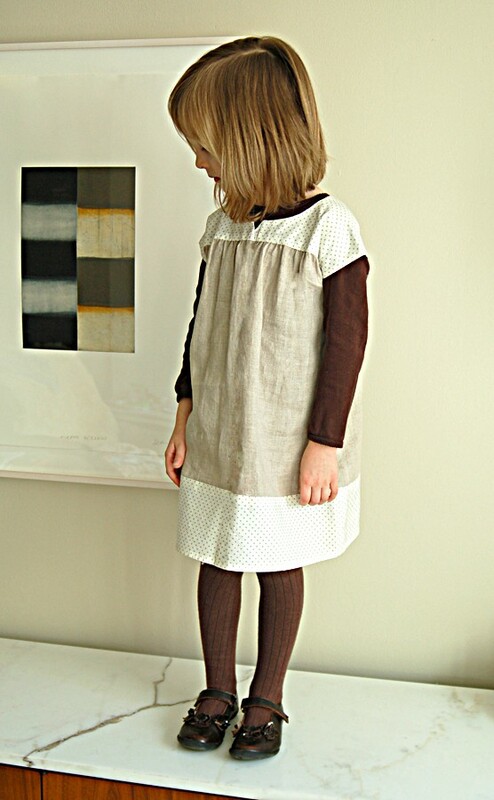 And I love the linen/cotton version your daughter is wearing – makes it so versatile for my mid-western winters. Can’t wait for the pattern to be released! I love the linen and cotton version! I just adore it! And your girl is such a sweetie! Where did you score brown children’s tights?? You are awesome! What a beautiful design, it is simple and yet oh so feminine for little girls without all the frou frou, really practicaly and lovely. Can’t wait to see your next posts. I am loving this dress and cannot wait to see the other variations. Will be buying this one as soon as it comes out for sure. I love it! I’ll definitely be making this for my little girl. Liesl, this is just gorgeous. Can’t wait to make this one too. I love that you are making classic children’s clothes fashionable again. This is such a clever pattern – highlighted by the pretty yellow version. Those three horizontal solid bands of yellow with the yoke, pockets and hem look really wonderful. Omigosh I hope the pattern’s going to be available soon! I’m ready to make a bunch of these for my girls. 🙂 The one piece yoke is a brilliant feature. Oh my goodness! What a darling little dress. I can’t wait to make my daughter one. YAY!